Floating table tennis game doubles as a floating or table top game. Solid foam core table measures 54"x27". Hard surface top provides excellent playback action. 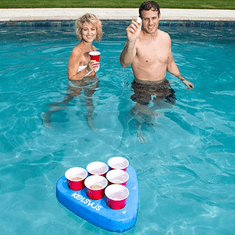 Includes 2 oversized floating paddles, game net with support, and 3 regulation balls.